The Orphists were rooted in Cubism but moved toward a pure lyrical abstraction, seeing painting as the bringing together of a sensation of pure colors. More concerned with the expression and significance of sensation, this movement began with recognizable subjects but was rapidly absorbed by increasingly abstract structures. Orphism aimed to dispense with recognizable subject matter and to rely on form and color to communicate meaning. The movement also aimed to express the ideals of Simultanism: the existence of an infinitude of interrelated states of being. The decomposition of spectral light expressed in Seurat, Signac and Pissarro during the last Impressionist exhibition in 1886. Henry would take the final step in bringing emotional associational theory into the world of artistic sensation: something that would influence greatly the Neo-Impressionists. Henry and Seurat were in agreement that the basic elements of art—the line, particle of color, like words—could be treated autonomously, each possessing an abstract value independent of one another, if so chose the artist. "Seurat knows well" wrote Fénéton in 1889, "that the line, independent of its topographical role, possesses an assessable abstract value" in addition, of course, to the particles of color, and the relation of both to the observer's emotion. The underlying theory behind Neo-Impressionsim would have a lasting affect on the works produced in the coming years by the likes of Robert Delaunay. Indeed, the Neo-Impressionists had succeeded in establishing an objective scientific basis for their painting in the domain of color. The Cubists were to do so in both the domain of form and dynamics, and the Orphists would do so with color too. The Symbolists had used the word orphique in relation to the Greek myth of Orpheus, who they perceived as the ideal artist. Apollinaire had written a collection of quatrains in 1907 entitled Bestiaire ou cortège d’Orphée (Paris, 1911), within which Orpheus was symbolized as a poet and artist. For both Apollinaire and the Symbolists who preceded him, Orpheus was associated with mysticism, something that would inspire artistic endeavors. The voice of light that Apollinaire mentioned in his poems was a metaphor for inner experiences. Though not fully articulated in his poems, the voice of light is identified as a line that could be colored and become a painting. The Orphic metaphor thus represented the artist’s power to create new structures and color harmonies, in an innovative creative process that combined to form a sensuous experience. The term Orphism was coined by poet and art critic Guillaume Apollinaire at the Salon de la Section d'Or in 1912, referring to the works of František Kupka. During his lecture at the Section d'Or exhibit Apollinaire presented three of Kupka's abstract works as perfect examples of pure painting, as anti-figurative as music. In Les Peintres cubistes Apollinaire described Orphism as "the art of painting new totalities with elements that the artist does not take from visual reality, but creates entirely by himself. [...] An Orphic painter's works should convey an untroubled aesthetic pleasure, but at the same time a meaningful structure and sublime significance. According to Apollinaire Orphism represented a move towards a completely new art-form, much as music was to literature. Orphic painters cited analogies with music in their titles; for example, Kupka’s Amorpha: Fugue in Two Colors (1912) and Francis Picabia’s abstract composition Dance at the Source (1912) and Wassily Kandinsky’s Über das Geistige in der Kunst (1912). Kandinsky's detailed theoretical essays described the correlations between color and sound. Robert Delaunay, also preoccupied with relations between color and music, highlighted the purity and independence of color, and successfully exhibited with the Blaue Reiter at the invitation of Kandinsky. Fernand Léger and Marcel Duchamp, as they tended towards abstraction, were also included as Orphists in the writings of Apollinaire. 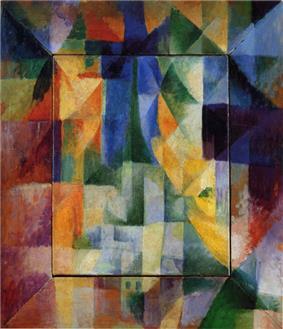 The Herbst salon (Erster Deutscher Herbstsalon, Berlin) of 1913, organized by Herwarth Walden of Der Sturm, exhibited many works by Robert and Sonia Delaunay, Jean Metzinger’s l'Oiseau bleu (1913, Musée d'Art Moderne de la Ville de Paris), paintings by Picabia, Léger and Albert Gleizes, along with several Futurist paintings. This exhibition marked a turning-point in Apollinaire’s relation with R. Delaunay (which would cool markedly), following some remarks in an argument with Umberto Boccioni about the ambiguity of the term ‘simultaneity’. This would be the last time Apollinaire used the term Orphism in his critical analyses of art; as he turned his attention increasingly towards Picabia and Alexander Archipenko, but most of all towards the Futurists. Robert Delaunay, Champs de Mars. La Tour rouge. 1911. Art Institute of Chicago. Sonia Terk Delaunay and Robert Delaunay, a husband and wife duo, were to become the main protagonists of the Orphic movement. In their earlier works, their styles focused on Fauvist colors with various degrees of abstraction; particularly evident in Sonia's Finnish Girl (1907) and Robert's Paysage au disque (1906). The former painting relies heavily on bright colors and smooth transitions between forms, while the latter relies on color and mosaic-like brushstrokes painted under the influence of Jean Metzinger, also a Neo-Impressionist (with highly Divisionist and Fauve components) at the time. Their works became increasingly identifiable by the 'simultaneous' contrasting of colors and the tendency towards non-representation. 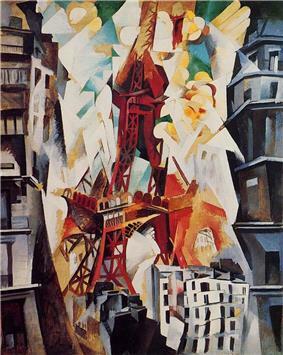 In Robert's Eiffel Town Series, the subject is portrayed as if seen from several viewpoints at once; employing the concept of 'mobile perspective' developed by his close friend Metzinger. Soon, instead of using muted tones as the Cubists, he would paint with bold, bright colors juxtaposed one next to the other (a concept derived from Neo-Impressionist color theory). He often portrayed the tower with reds and pinks with cooler colors throughout. The more Robert painted the tower, the more abstract, fragmented and colorful it became. In 1913 the Delaunays showed their works in the Salon des Indépendants and the Herbst Salon, the latter being the first Orphist Salon, which also hosted works by Picabia, Metzinger, Gleizes, Léger, and Futurist painters. Unlike others associated with Orphism, the Delaunays would return to this style throughout their lives. 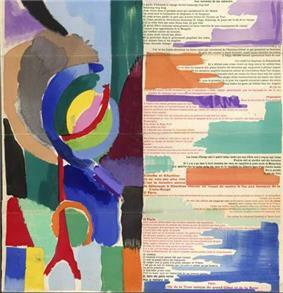 The last section of La prose du Transsibérien et de la Petite Jehanne de France, 1913, a collaborative artists' book by Blaise Cendrars and Sonia Delaunay-Terk. One of Robert's biggest influences, besides his wife, was the chemist Eugène Chevreul. Most famous for discovering margarine, Chevreul delved in dye chemistry as well as the aesthetics of simultaneous contrast of colors. He had three main ideas to his color theories: "when complementary colors are juxtaposed, each appears to be more intense than when seen in isolation" and "if there is a perceptible difference in dark-light value between the two colors, then the darker will appear to be even darker" as well as that "all colors present in the field of vision at the same time mutually modify one another in specific ways". Chevreul influenced many artists because he understood scientifically what many artists expressed instinctively. Even after Apollinaire had separated from the Delaunays and Orphism had lost its novelty as a new art form, the Delaunays continued painting in their personal shared style. They may not have always called their work Orphic, but the aesthetics and theories were the same. Robert continued painting while Sonia delved into other media, including fashion, interior and textile design, all within the realm of Orphism. Orphism as a movement was short-lived, essentially coming to an end before Stanton Macdonald-Wright wrote their own manifestos in an attempt to distance themselves from the Orphism of Robert Delaunay, but their art at times inevitably appeared Orphic. Essentially a stylistic sub-category of Abstract art created by Apollinaire, Orphism was an elusive term from which artists included within its scope persistently attempted to detach themselves. Buckberrough, Sherry A. Robert Delaunay: The Discovery of Simultaneity. Ann Arbor, Michigan: UMI Research Press, 1978. Chadwick, Whitney; de Courtivron, Isabelle. (ed) Significant Others: Creativity and Intimate partnership. London: Thames & Hudson, 1993. Chip, Herschel B. "Orphism and Color Theory". The Art Bulletin, Vol. 40, No. 1, pp. 55–63, Mar 1958. Damase, Jacque. Sonia Delaunay: Rhythms and Colours. Greenwich, Connecticut: New York Graphic Society Ltd, 1972. Hughes, Gordon "Envisioning Abstraction: The Simultaneity of Robert Delaunay's First Disk". The Art Bulletin, Vol. 89, No. 2, pp. 306–332, Jun 2007. The College Art Association. Stangoes, Nikos (ed). Concepts of Modern Art: Fauvism to Post-Modernism. Chapter: "Orphism", Virginia Spate. (Revised) London: Thames & Hudson, 1981.